"Candy Crush" redirects here. For the game show, see Candy Crush (game show). Candy Crush Saga is considered one of the first and most successful uses of a freemium model; while the game can be played completely through without spending money, players can buy special actions to help clear more difficult boards, from which King makes its revenues—at its peak the company was reportedly earning almost $1 million per day. Around 2014, over 93 million people were playing Candy Crush Saga, while revenue over a three-month period as reported by King was over $493 million. Five years after its release on mobile, the Candy Crush Saga series has received over 2.7 billion downloads, and the game has been one of the highest-grossing and most-played mobile apps in that time frame. King has since released three related titles, Candy Crush Soda Saga, Candy Crush Jelly Saga, and Candy Crush Friends Saga. The game is primarily monetized through in-app purchases (through either a credit card, iTunes credits or Google Play credits); players begin with five "lives", lost whenever a level is failed. This applies to all of King's games. When they are exhausted, users can either send requests to their Facebook friends for more lives, wait for them to replenish themselves (a life is restored every half-hour), or purchase them. Initially when a player makes a purchase for new lives, they receive five new lives for a specific dollar amount. In a recent update, when a player makes a purchase for new lives, the player receives gold bars, the quantity depending on how much money they spend. Gold bars can be used for new lives, extra moves, boosters or to unlock a new episode. At certain points, primarily at the start of new "episodes", users must also either purchase or receive a request from at least three friends before they may access the next set of levels. An update meant players only waited for 3 days to unlock the next episode. Boosters, to make the levels easier, can be bought using in-app purchases. While the game includes freemium content, 97.7% of those playing the game do so for free, while only 2.3% pay. Throughout the game, the player solves puzzles so Tiffi (short for Toffette) can solve problems plaguing the residents of the Candy Kingdom. These include tutorial guide Mr. Toffee, whose voice was changed from an over-the-top French accent in the original version of the game into a more modest deep male voice; the Easter Bunny; the shop owner Mr. Yeti; Odus the owl from Dreamworld levels; the villainous Bubblegum Troll; and many others. In the Candy Crush Jelly Saga, the two main characters that the player plays against are the Jelly Queen and Cupcake Carl. Prior to the release of Candy Crush Saga, most of King's games were browser games offered through their website or partner portals such as Yahoo!. Several of their games featured tournament-style gameplay, where players could spend money to enter competitive tourneys for in-game boosts, which served as one of the main form of revenue for the company in addition to in-game item sale microtransactions and advertisements. Around 2009, Facebook began to pull in developers, in particular Zynga, to offer social network games that could be built on its fundamental services; for King, this resulting in a large drop in players that they saw from their game portals within a year. At this point, King started to determine how it could enter the Facebook and the associated mobile game markets, breaking up its web development department to work on Facebook and mobile games in 2010, including bringing several of their existing browser games to those platforms. Most of these existing games were introduced as beta versions to Facebook users, and the company used player counts and feedback to determine which of these titles had the most prospect for moving forward, allowing them to focus more intensive development on those titles while dropping the rest, in the style of a rapid prototyping approach. The Facebook platform allowed them to explore expansion of their existing tournament-style games and the ability to include microtransactions within the game. In April 2011, King released its first cross-platform (Facebook and mobile) game, Miner Speed, which had a simple match-3 concept that borrowed concepts from Bejeweled that helped the company figure out the transition between Facebook and mobile games for this new direction. King's first major success in this area followed with Bubble Witch Saga, released in October 2011; by January 2012 it has attracted over 10 million players and was one of fastest rising Facebook games at that time. Bubble Witch Saga introduced the "saga" approach in contrast to typical tile-matching games, where instead of having the game continue through a fixed amount of time or until the player reached an unplayable state, the game was divided into discrete levels that required the player to complete certain goals within a fixed set of moves, and where the next level could only be reached after completing the previous level. These saga elements allowed for the basics of social gameplay, but did not require the time investment that then-popular titles like Zynga's Farmville required; players could play just for a few minutes each day through the saga model. The success of Bubble Witch Saga establishing King as a viable developer in this arena, becoming the second-largest developer by daily player count on the Facebook platform by April 2012, trailing only Zynga. Candy Crush Saga was selected as King's next Facebook game based on the popularity of the portal version of Candy Crush, first released in 2011 and which was one of the five most popular games by 2012. The basic ideas from Miner Speed were used to craft the foundation of Candy Crush Saga, adding the "saga" elements from Bubble Witch Saga. Initial ideas for Candy Crush Saga were proposed by King's chief creative officer, Sebastian Knutsson, around 2011. The game was first released for Facebook in April 2012, at the time featuring only 65 levels. The game quickly gained popularity, gaining more than 4 million players within a few weeks of release. King later released mobile versions for iOS and Android that same year, adding a feature that allowed mobile users to synchronize their progress with the Facebook version. Knutsson stated that at that time, with Candy Crush Saga as popular as it was on Facebook, they knew that they "had to get it right" in the transition process. King had previously discussed the nature of games that kept their state between a PC and mobile version with Fabrication Games, believing this was a necessary trend in the future of gaming, Both recognized several of the difficulties that would have to be addressed to provide both the progress synchronization and gameplay interface between mouse-driven PC computers and touch-driven mobile devices. King found that one issue with transiting Bubble Witch Saga to mobile was that the gameplay elements were too small for mobile devices, and aimed to correct that for Candy Crush Saga on mobile. The mobile release delay for Candy Crush Saga was in part due to adding the ability to play the mobile version in an offline mode that would still synchronize once the player returned online. The mobile version helped to boost popularity of the game, attributed to the nature of the game being able to be played in a pick-up-and-go manner ideally suited for mobile devices. Tommy Palm, one of the four developers for Candy Crush Saga, stated that the first weekend numbers after the game's mobile release were over ten times greater than the estimates they expected. By January 2013, Candy Crush Saga overtook Zynga's Farmville 2 as the top-played game on the Facebook platform. Candy Crush Saga was expanded over the years by adding new episodes, each containing a number of new levels. This enabled King to also introduce new gameplay features alongside other game improvements. New features were first tested on King's own portal to see how players there responded and allowing them to tweak these as needed, then pushed these into the episodes on the Facebook/mobile version. By September 2016, King released its 2000th level for the game to celebrate the milestone of over 1 trillion Candy Crush Saga games having been played. More recently, with the game offered as a free-to-play model, King seeks to provide new content on weekly or biweekly basis, including time-limited content. Zacconi saw this approach as a means to keep players, who otherwise have not purchased anything, to keep coming back and playing the game. According to review aggregator website Metacritic, the game received an average review score of 79/100, indicating generally positive reviews. Ellie Gibson of Eurogamer referred to Candy Crush Saga as 2013's "Game of the Year". By 2013, Candy Crush Saga had been downloaded more than 500 million times across Facebook, iOS, and Android devices and considered the most downloaded app from the Apple App Store, and had at least 6.7 million active users on a daily basis; the game had a daily revenue of $633,000 from the United States section of the iOS App Store alone. By 2014, the game had over 245 million active players each month but has since dropped off, with that count falling to around 166 million by 2016. It again rose back to 293 million active monthly players by November 2017. Though initially released with advertising to help with revenue, King removed the advertising in 2013, and solely has earned money from the game in the form of in-app purchases. Only a small percentage of the player base has purchased in-game items, up to around 4%, but this has led to millions of dollars in monthly revenue for King. In 2014, Candy Crush Saga players spent over $1.33 billion on in-app purchases. This is a decline from the previous year, since in the second half of 2013 players spent over $1.04 billion. By 2015, the monthly revenue was estimated at $120 million, but with declining players purchasing in-game items, down to 2% by 2016, that revenue has dropped to just over $53 million per month.Again, by the end of October 2018, the monthly revenue rose to $128 million. Five years after its release on mobile, the Candy Crush Saga series has received over 2.73 billion downloads. Its revenue for the quarter ending September 2017 was $250 million, having gained significant improvement in year-to-year revenues from 2016. It remains one of the top gross-revenue earnings app for mobile in the four years leading up to 2017.By the end of July 2018, the total revenue earned by this game stood at $3.91 billion. Candy Crush received particular mention in Hong Kong media, with reports that one in seven Hong Kong citizens plays the game. In December 2013, King entered the Japanese market with a series of television commercials in Japan, and by December 4 it had become the 23rd most downloaded game in Japan on Android devices and number 1 most downloaded from the App Store.It is also the most popular game in the UK of all time. 58% of the players are women, while 46% of the players are of Gen X, though more youths and children play it. Candy Crush Saga won the People's Choice Awards for Favorite Mobile Game 2016. Other nominees were Fruit Ninja, Despicable Me: Minion Rush, Plants vs Zombies and Temple Run. It was also the winner of 9th International Mobile Gaming Awards for the Best Social Game. King filed for applications for trademarks on the word "candy" in January 2013 with the United States Patent and Trademark Office, which became publicly known in January 2014. News of these pending trademarks raised concerns from other developers, fearing that King would use their trademark to intimidate smaller developers. In response to this criticism, King decided not to pursue the trademark. The mobile game known as CandySwipe created in 2010, two years prior to the release of Candy Crush Saga, had many similarities that independent app developer Albert Ransom and maker of CandySwipe picked up on as Candy Crush Saga became more successful. Following news of the "candy" trademark, Ransom issued a statement in February 2014, claiming that King intentionally copied elements from his own game including the app icon, the art for the candy pieces, and sound effects like the level-completion "Sweet!". While details were not given, Ransom stated that he "amicably" resolved the matter with King by April of that year. During this same period, it was discovered that King had applied for a trademark on the word "saga", and they had taken action against Stoic, the developers of The Banner Saga; King had attempted to block Stoic's registration of "The Banner Saga", and after the game released in January 2014, it issued a cease and desist letter to the developers (King's trademark application was still pending approval at this time). Similar to the CandySwipe situation, Stoic announced in April 2014 that the situation with King had been resolved with both sides coming to an agreement allowing Stoic to continue to use their name. Candy Crush Saga also received mixed reactions when it was announced that King had struck a deal with Microsoft to automatically install/reinstall the game on devices that have been upgraded to Windows 10 Home. Candy Crush Saga is considered to be an addictive game as it uses a compulsion loop that provides pleasurable reinforcement the more one plays. The game was investigated by the UK Office of Fair Trading concerning exploitative game mechanics with regards to younger users.However, it still remains as the top-grossing mobile game of all time in the United Kingdom. In May 2014, a sequel titled Candy Crush Soda Saga was soft launched by King, with a similar design but new gameplay dynamics, such as a soda bottle piece that can shift gravity. As of January 2018[update], there are over 2080 Candy Crush Soda Saga levels. On October 20, 2014, the Facebook version of Candy Crush Soda Saga was released worldwide and the mobile app was released in November on the Android and iOS platforms. The app was subsequently made available for Windows 10 and Windows Phone in October 2015. Among other gameplay changes, Candy Crush Soda Saga introduces soda candies that release soda that fill the puzzle board from the bottom up, causing candies to float up to the highest soda level. In September 2015, another sequel named Candy Crush Jelly Saga was soft-launched in various countries for the Android platform. Candy Crush Jelly Saga was released worldwide in January 2016. Initially it was not made available in Facebook unlike in previous titles, but is now available as a game app as of May 2016[update]. The Facebook version appears to no longer require Adobe Flash to play. The game introduces jelly-filled squares. Matches made with candies occupying jelly-filled squares will generally cause all squares that were part of the match to become jelly-filled, with the goal of making all squares on the gameboard filled with jelly to complete the puzzle. A third sequel, Candy Crush Friends Saga, was released on both iOS and Android in October 2018. Prior to each round, the player may have the ability to select one of the series' characters to assist with the puzzle. 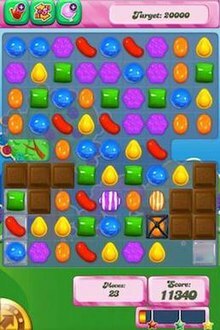 Each character has a power that activates after a certain number of candies of a specific color are collected, such as converting a candy on the board to a wrapped candy.This game earned $5.6 million in its first month, and $10 million by June 2018. CBS produced a live-action Candy Crush game show in partnership with King that premiered on July 9, 2017. It was an hour-long competition among several two-person teams using interactive games that are based on Candy Crush. The show was produced by Lionsgate with executive producer Matt Kunitz, and with collaboration by Sebastian Knutsson, the creative developer of the first Candy Crush game. Mario Lopez hosted the show. Four teams play in each episode doing various challenges based on the Candy Crush game, with the winning team earning a guaranteed $100,000. The game is also featured in Psy's music video "Gentleman". Part of The Emoji Movie takes place within Candy Crush Saga. Candy Crush Saga was used as a challenge theme for an episode of the sixth season of Project Runway All Stars. ^ "Candy Crush at Games.com". Archived from the original on September 6, 2015. ^ a b c d Cabebe, Jaymar (April 3, 2013). "Candy Crush Saga for Android review: Great alternative to Bejeweled". CNet. Retrieved December 12, 2016. ^ Fahey, Mike (December 12, 2013). "The First Candy Crush Saga Expansion Changes The Way The Game Is Played". Kotaku. Retrieved December 12, 2016. ^ "Sugar Coma". Slate. July 2013. Retrieved January 24, 2014. ^ a b Candy Crush Saga players spent £865m on the game in 2014 alone, theguardian.com, February 13, 2015. ^ "What is the appeal of Candy Crush Saga?". Bbc.com. December 18, 2013. Retrieved May 21, 2014. ^ a b Pham, Alex (April 17, 2012). "Games publisher King.com topples EA, Wooga on Facebook, for now". Los Angeles Times. Retrieved October 19, 2016. ^ a b c d e f Rooney, Ben (June 19, 2014). "King Saga: The Story Behind The Maker Of Candy Crush Saga". Informilo. Retrieved October 19, 2016. ^ O'Brien, Chris (November 15, 2012). "If social games on Facebook are dying, why is King.com booming?". San Jose Mercury News. Retrieved October 19, 2016. ^ Takahashi, Dean (February 18, 2011). "King.com takes tournament games into Facebook". Venture Beat. Retrieved October 19, 2016. ^ Takahashi, Dean (April 28, 2011). "King.com launches its first cross-platform mobile game". Venture Beat. Retrieved October 19, 2016. ^ Caoili, Eric (January 10, 2012). "Fastest-growing Facebook games: From Tetris Battle to Words With Friends". Gamasutra. Retrieved October 19, 2016. ^ Takhashi, Dean (April 12, 2012). "At 2.5B games played a month, King.com reaps benefits from its casual Saga titles on Facebook". Venture Beat. Retrieved October 19, 2016. ^ a b c d Takihashi, Dean (August 18, 2014). "Lessons from a game guru: Candy Crush Saga creator once survived six months without pay". Venture Beat. Retrieved October 20, 2016. ^ Weber, Rachel (July 18, 2013). "Working at the Candy Store". GamesIndustry.biz. Retrieved October 19, 2016. ^ Caoili, Eric (May 1, 2012). "Candy Crush Saga highlighted in this week's fastest-growing Facebook games". Gamasutra. Retrieved October 19, 2016. ^ Lien, Tracey (January 17, 2013). "King.com's Candy Crush Saga takes the top spot on Facebook, but Zynga still dominates". Polygon. Retrieved October 19, 2016. ^ Wortham, Jenna (July 2, 2013). "Candy Crush Saga Is This Summer's Sweet Treat". New York Times. Retrieved October 19, 2016. ^ Kelion, Leo (September 28, 2016). "Candy Crush Saga: Life beyond level 2,000". BBC. Retrieved October 19, 2016. ^ Miniotti, Mike (September 28, 2016). "Candy Crush Saga adds 2,000th level to celebrate 1,000,000,000,000 games played". Venture Beat. Retrieved October 19, 2016. ^ a b c Takahashi, Dean (November 17, 2017). "Candy Crush Saga: 2.73 billion downloads in five years and still counting". Venture Beat. Retrieved November 17, 2017. ^ a b "Candy Crush Saga for iPhone/iPad Reviews". Metacritic. CBS Interactive. Retrieved July 5, 2018. ^ Gibson, Ellie (December 24, 2013). "Games of 2013: Candy Crush Saga". Eurogamer. Gamer Network. Retrieved January 22, 2014. ^ Webster, Andrew (November 15, 2013). "Half a billion people have installed 'Candy Crush Saga'". The Verge. Vox Media. Retrieved November 18, 2013. ^ Musil, Steven (December 16, 2013). "Candy Crush Saga tops iTunes app download list for 2013". CNet. Retrieved December 12, 2016. ^ Joe White (July 9, 2013). "Freemium App Candy Crush Saga Earns A Record-Breaking $500 Each Day". AppAdvice. Retrieved September 30, 2013. ^ a b c d van Dreunen, Joost (October 24, 2016). "Welcome to the New Era: Games as Media". GamesIndustry.biz. Retrieved October 31, 2016. ^ "20 Amazing Candy Crush Facts and Statistics". DMR. November 4, 2017. Retrieved October 21, 2018. ^ a b c d "20 Amazing Candy Crush Facts and Statistics". DMR. November 5, 2017. Retrieved January 3, 2019. ^ "King's Candy Crush franchise has cleared 2.73 billion downloads five years since launching on mobile". Pocket Gamer. November 14, 2017. ^ Grubb, Jeffrey (December 6, 2013). "King is running TV commercials for Candy Crush in Japan, and they're working". GamesBea. VentureBeat. Retrieved December 7, 2013. ^ "candy crush saga awards - Google Search". www.google.com. Retrieved January 9, 2019. ^ "Candy Crush Saga". International Mobile Gaming Awards. Retrieved January 9, 2019. ^ Pitcher, Jenna (January 21, 2014). "Candy Crush Saga developer trademarks 'candy'". Polygon. Retrieved December 12, 2016. ^ Lien, Tracey (January 21, 2014). "What King's 'candy' trademark really means". Polygon. Retrieved December 12, 2016. ^ Makuch, Eddie (February 25, 2014). "Candy Crush dev abandons "Candy" trademark in US after controversy". GameSpot. Retrieved December 12, 2016. ^ Good, Owen (February 12, 2014). "Indie Creator of CandySwipe Fumes Over Candy Crush Saga Trademark Move". Kotaku. Retrieved December 12, 2016. ^ Maiberg, Emanual (April 19, 2014). "Candy Crush Saga settles dispute with CandySwipe "amicably"". GameSpot. Retrieved December 12, 2016. ^ Yin-Poole, Welsey (June 26, 2014). "King vs The Banner Saga". Eurogamer. Retrieved December 12, 2016. ^ Lien, Tracey (April 17, 2014). "Candy Crush maker King settles trademark disputes with The Banner Saga developer". Polygon. Retrieved December 12, 2016. ^ Walton, Mark (May 15, 2015). "Humanity weeps as Candy Crush Saga comes preinstalled with Windows 10". Ars Technica. Condé Nast. Retrieved September 27, 2015. ^ Stuary, Keith (May 21, 2014). "My favourite waste of time: why Candy Crush and Angry Birds are so compulsive". The Guardian. Retrieved September 10, 2018. ^ Dockterman, Eliana (November 15, 2013). "Candy Crush Saga: The Science Behind Our Addiction". Time. Retrieved September 10, 2018. ^ "Candy Crush Saga Has Trademarked Candy And Apple's App Store Is Helping Enforce It". Forbes. ^ "Candy Crush Game Maker Banks on Soda Saga Sequel". The Hollywood Reporter. Retrieved July 28, 2014. ^ "Candy Crush Soda Saga, the sequel to Candy Crush Saga, got soft-launched on Android". phonearena.com.com. Retrieved August 27, 2014. ^ "Candy Crush Soda Saga: will it pop King's app store bubble?". The Guardian. Retrieved October 26, 2014. ^ "Can't get Enough of 'Candy Crush'? Say Hello to 'Candy Crush Soda Saga'". Tech Times. November 12, 2014. Retrieved November 15, 2014. ^ "'Candy Crush Soda Saga' from King Finally Launches Worldwide". Touch Arcade. November 11, 2014. Retrieved November 15, 2014. ^ "Candy Crush Maker Launches Sequel to Hit Mobile Game". The Wall Street Journal. Retrieved November 15, 2014. ^ a b "Candy Crush Jelly Saga Levels". Candy Crush Soda Saga Tips. Retrieved December 17, 2015. ^ "Candy Crush Friends Saga â€" Apps on Google Play". play.google.com. Retrieved January 26, 2019. ^ Minoitti, Mike (October 19, 2018). "Sensor Tower: Candy Crush Friends Saga's 10 million first-week downloads have a sour note". Venture Beat. Retrieved October 19, 2018. ^ "20 Amazing Candy Crush Facts and Statistics". DMR. November 5, 2017. Retrieved January 3, 2019. ^ Lawler, Richard (March 17, 2017). "The 'Candy Crush' TV show debuts on CBS July 9th". Engadget. Retrieved March 17, 2017. ^ Larson, Selena (October 18, 2016). "A 'Candy Crush' game show is coming to CBS". CNN. Retrieved October 18, 2016. ^ Brian Ashcraft (April 17, 2013). "Is PSY's "Gentleman" Video Just a Giant Commercial?". Kotaku.com. Retrieved April 27, 2013. ^ "Sony Debuts 'Emoji Movie' With Vertical Teaser Trailer". The Hollywood Reporter. December 20, 2016. Retrieved December 30, 2016. ^ Macian, Ernest (March 28, 2018). "Project Runway All Stars recap: 'Nina's Crushing It'". Entertainment Weekly. Retrieved May 3, 2018. Wikimedia Commons has media related to Candy Crush Saga.